At first I thought that that mass couldn't be right, since it's 46 times as heavy as the largest ship in vanilla. But after estimating its volume, I calculated a density of .19 T/m^3 (a.k.a. g/cm^3). That's, if anything, lighter than I expected. So I think the problem is with the masses of some ships in vanilla (specifically the ones that aren't long and thin). Ticketed. Also, who in human space can afford to build monsters like that? I'd just give them some top - secret von - neumann machines that strip - mined an entire system to build it/them. Could even toss in the system they mined bare as a leaf node from their capital system, complete with some abandoned shipyards and a few little assembler drones still roaming around. It seems like it would fit the faction's theme to head out, find an isolated, empty system, see to it that it doesn't show up on any maps, seal off the exit with a large fleet at the only gate that shoots any unauthorized visitors on sight, and then go to work turning it into a giant shipyard for their military. Overall development has kind of stalled for the time being. Missions are next on my agenda, and have been for months. And I keep finding ways to procrastinate and not get started on them. I’m… kinda not looking forward to doing them. I’m not even entirely sure how to do them, at least not using any of the msn* functions. I could theoretically do objSetData/typSetData missions, but I haven’t tested anything out along those lines. It’s probably how I’m going to wind up doing the majority of my mission work, though. That's pretty cool. Definitely a major improvement. Almost everything recently got re-rendered (again) for a ridiculously minor detail I wanted to fix. I’ve also given Ironground a shipyard, which is not yet implemented as of posting this. It’s big, though. Big. Not quite Polyarny big, but still pretty hefty. Ironground and Legion weapons also now have their own custom sound effects. 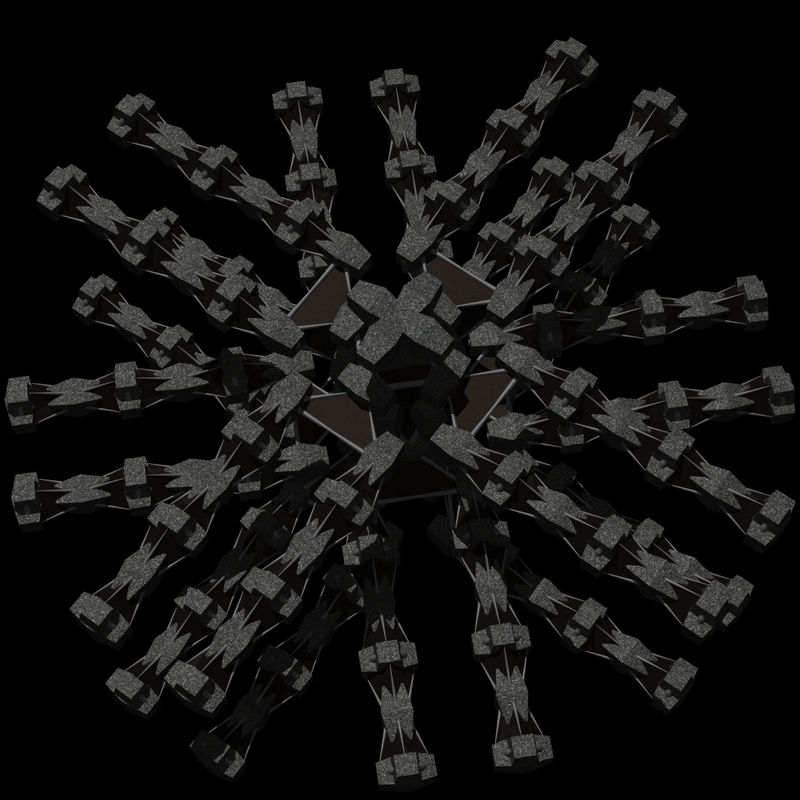 This was inspired partially by some of Wolfy’s TSB weapons and partially by mine and Shrike’s work on SNAPSS. I did a minor update to a couple of topological areas, specifically trimming down the Kourienne loop (which is not yet updated on Multiverse as of this post) and relocating and renaming Ironground’s capital system from Retribution to Justice, while renaming the already existing Justice system to Honor Order. The aforementioned shipyard is going to wind up in the Canis Aster system, which leads to Justice. One thing on the agenda for the near future is actually coding up a proper system for Justice instead of basically sort of hacking the Iron Snowflake into an otherwise vanilla system. Canis Aster will get similar treatment. I’ll probably be borrowing ideas from Tau Ceti to make these work. I don’t really have much progress on missions as yet, though I do have some preliminary groundwork laid for the culmination of the Ironground/Yatfwan war. Also, Ironground starts liking you less the friendlier you are with either Yatfwan or the Black Market. Yatfwan will be similarly less friendly as your rank improves in either the Commonwealth Fleet or Ironground Navy, and Haetenaro, like Ironground (though for different reasons), will frown upon close ties with the Sindikat. There have been numerous minor bug fixes and assorted tweaks to mechanics. I have everything documented unless I missed something, which is not beyond the realm of possibility in TBRChangelog.xml if you want to decompile the TDB file to poke at it. Behind the scenes, I’ve been working on lore for varying factions, and have actually been working fairly closely with Wolfy on a few aspects that tie in with ideas from The Stars Beyond. None of this is readily apparent in-game as yet, but at least some of it will wind up being important at some point or another. Also, as always, if you’re interested in getting in on the beta, send me a PM or poke me on IRC and I’ll get you set up. Bug reports and balance suggestions are always welcome, and I can always use more testers looking to find ways to test (or break) my code! Also, the Ironground shipyard. Just because I can. IMPORTANT NOTICE! There have been reports of TBR repeatedly downloading. George himself was having this problem with his stream on Thursday. The issue is that one of the libraries it uses had its filename changed, which apparently confuses the game. To fix it, you need to go into the Collection folder for Transcendence and delete TheBackroadsGraphicsLibrary.TDB — this file is outdated and no longer used. Once you do this, everything should work normally again. Less important notice: It has come to my attention thank you, Relanat that I did not have the link to TBR’s Ministry page readily available. It’s sort of buried in a very short post somewhere on Page 7. I’ve remedied this by adding a link to on the first post of the thread. Update of the (insert random time period here): I’ve decided to redesign Bane. This has less to do with any dissatisfaction with the current graphics and more to do with the fact that I know I’ll have to rerender them at some point. …Again. The current designs are an absolute nightmare to render — the Entropy takes over a month — so I’m scrapping them in favor of new designs. My inspiration, oddly enough, came from having seen a Thor’s Wondrous Devices station with an EI7000 docked at the top and an EI100 at either side from halfway across the room while I didn’t have my glasses on. (12:46:27 AM) TLW: I like that color theme! (12:46:51 AM) AssumedPseudonym: So do I, but I do think it needs a slight update at some point. So that’s happening. It won’t be done in time for Thursday’s stream, but this is exactly why I redesigned Bane to begin with: Friday is a much more reasonable ETA than mid-to-late February. I’ll probably update again over the weekend to get the new graphics into the game. I was wrong. It did get done and ready before tonight’s stream, so the update has happened. I even had time to add the Lambda Coalition’s HQ while I was at it and about bloody time, too, though its current functionality is no better than their Agency stations. 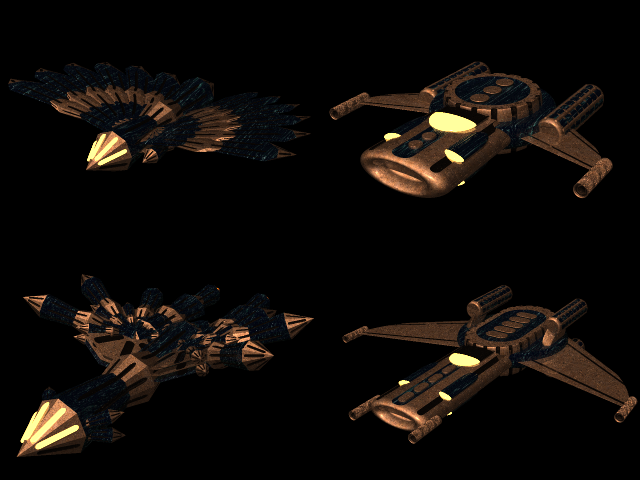 Due to a minor oversight on my part, the resource library was uploaded with the old version of Bane’s color scheme on their ships. 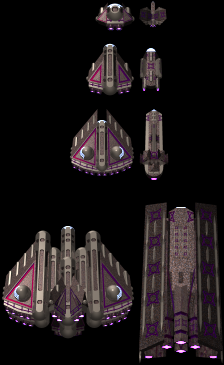 The stations and the hero image and armor HUD for the Nemesis were correct, but the actual ship sprites were the outdated scheme. This has been fixed. Sorry about yet another 200+MB download from a slow server, everyone. …And then I updated TBR again, because Lambda’s headquarters was using the Agency sprite instead of the Headquarters sprite. That’s only the main library, though, not the 200+MB resource library. Easy fix, quick download. I didn’t even update the version from the previous post, still on 0.5.7-b currently.